You must be a member of the Amsterdam Boat Trips Group to attend this activity. Would you like to join this group? Join me for this special Workshop where we will learn how to smoke salmon. Frank, the owner of theProtected content will teach us the whole process of smoking a wild Alaskan salmon. Of course, we will be able to taste, what we have smoked altogether. Along the smoking part, we will learn many other things about the smoking process. We will learn as well about how to recognize a wild salmon from the cultivated one and much more. 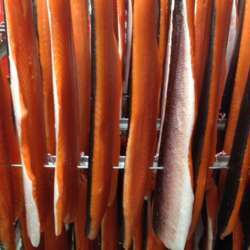 EUR 23.- workshop + welcome drink + tasting our wild Alaskan smoked salmon. Only after receiving the payment, your place is secured. We need to be at least with 10 people to make it happen. There is room for a maximal 15 people.